There’s graffiti all over Jozi. And Jozi is loving it. In the last decade, the city’s walls – and being Jozi, there are many - have become increasingly embellished. The graffiti ranges from edgy street art to commissioned large scale murals and even entire suburbs have become graffiti art projects. You can take various graffiti-related tours and the best spotting spots are Maboneng, Troyeville. Braamfontein and Westdene, but there’s plenty of random graffiti under just about every bridge and even in the gracious Parks areas you can check out graffiti in the green belt. BHB takes you on a walk about. That was the aim of the Westdene Graffiti Project which has seen a section of this Boho suburb offer up its walls for adornment and colour. There are now nearly 40 murals and the streets feature giant dreamy women, surreal apes, sidewalk zebras and assorted Afro acid imagery. This is some of Jozi’s finest graffiti art. There’s a delicious turnover of new walls and new art, as more residents offer their walls and old pieces get painted over. This community mural initiative is run on the I Love Westdene Facebook group, with the help of Jozi graffiti photographer and Westdene resident Derek Smith. On a walking tour with the Roving Bantu Kitchen in the nearby suburb of Brixton the graffiti becomes grittier. 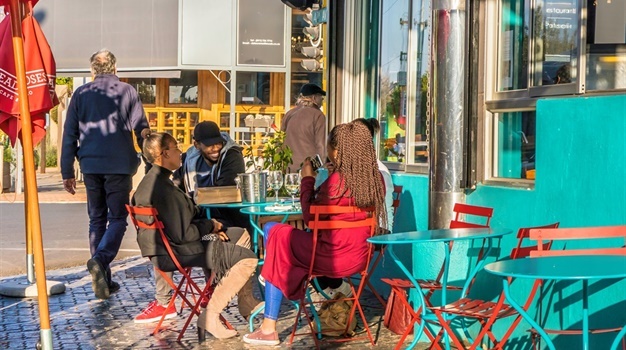 Natural born raconteur and self-proclaimed freedom peddler, Sifiso Ntuli walks and talks you through a six kilometre trek into the western inner city edges of Jozi through the suburbs of Brixton and Fietas - the collective name for Pageview and Vrededorp. The walk begins with coffee and vetkoek at the Roving Bantu Kitchen in Brixton and ends with a delicious lunch with live music. “Jazz and freedom”, says Ntuli, “that’s the spirit we want here”. Across the city, commissioned large scale murals are the masterpieces of Maboneng and New Doornfontein. You can see the giant Jan van Riebeck who looks out above the Cosmopolitan building. And nearby is the iconic forty-metre mural of Mandela as a boxer that covers an entire side of a building. It was completed the weekend Madiba died and was done by Rocky Lee Gordon based on a photograph by Bob Gosani. Take the graffiti tour with the dynamic Jo Buitendach of Past Experiences who will tell you all about Jozi’s passionate graffiti culture. “These tours focus on the history of the movement internationally as well as looking closely at the graffiti culture in Jozi. We show you the work of major players and top artists and some of the amazing art that snakes its way across our city walls”, says Jo. Depending on what you’re after the graffiti tour goes into Maboneng and Troyeville, the CBD and Newtown and just about anywhere in between. You can do tours with some of the top graffiti artists and see work by Myza420, Mars, Rasty, Tyke, Curio, Mein, Bias, Ryza, Riot, Drake and Tapz, as well as numerous international artists who’ve left their mark on the Jozi streets. There’s a new giant Mandela that’s popped up in Braamfontein, another suburb where graffiti has become part of the hip inner city vibe. This student district buzzes with café culture, street fashion and a youthful energy. The area is also home to art galleries, public art and graffiti on just about every corner. Street art has often been a contentious topic but in Jozi, local artists are gaining more recognition, international artists are coming to leave their mark on our city streets and corporates are beginning to pump money into inner city street art.